Louise Abel ovoid vase in warm yellow with stylized leaves and red flowers at the shoulder, with date, pottery marks, artist's initial, ht. 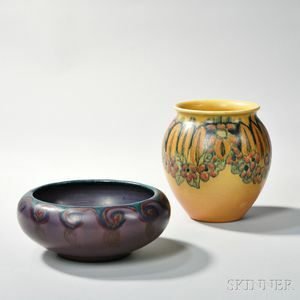 6 1/2; Vera Tischler low bowl in eggplant with wave pattern in green, ochre, and red at rim, with date, Rookwood mark, and artist's initials, dia. 8 in.